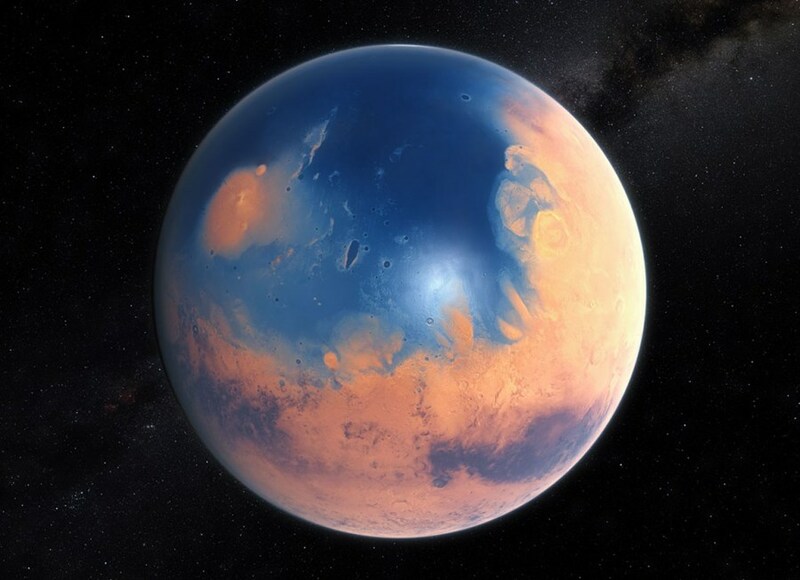 By comparing the ratio of "heavy water" (in which one hydrogen atom is replaced by its heavier isotope deuterium) to "normal water" in the atmosphere of Mars, scientists at NASA and the European Southern Observatory (ESO) have come to the conclusion that the Red Planet was once home to a large ocean that covered a greater portion of the planet's surface than the Atlantic Ocean does on Earth. The international team of scientists used ESO's Very Large Telescope, along with instruments at the W. M. Keck Observatory and the NASA Infrared Telescope Facility, to monitor the atmosphere of the planet and map out the properties of the water in different parts of Mars's atmosphere over a six-year period. "Our study provides a solid estimate of how much water Mars once had, by determining how much water was lost to space," said Geronimo Villanueva, a scientist working at NASA's Goddard Space Flight Center in Greenbelt, Maryland, USA, and lead author of the new paper. "With this work, we can better understand the history of water on Mars." Watch NASA's video and read more on the ESO website.